Maybe if I had a blog that was visited by tens of thousands every day and on which hundreds wanted to comment it would not be so easy, but “comment spam” is not a problem here – anything which the algorithmic spam filter does not pick up can be chucked out by hand. But in recent weeks I have seen a new form of blog spamming – “like spamming” against which WordPress seem to have given me no protection. 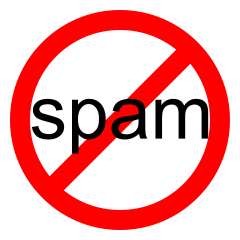 Spammers – usually they are SEO snake oil sellers or link farmers – come here and like a post – that gives them an automatic link back to their blog. I don’t want to discourage anyone who genuinely likes my blog – but let me warn the spammers. From this point onwards spam-like likes will see your blog reported to WordPress.com as spam.